And every time she uses it, she’ll think of you. Does your mom love a good cup of coffee? Has she embraced pour over coffee yet? Everyone’s been through that stage of loving their high-tech newfangled automatic coffee machine. So…what are coffee lovers doing now? I have two words for you. Pour over. This is a meditative experience. Pour over coffee isn’t about slapping some coffee into a machine and pulling out a cup full. Ohhh no. Pour over coffee is a fuller, deeper experience. The coffee is richer and more satisfying. I know a number of coffee lovers who won’t even travel without their pour over kettle and filter because they dread having to buy a restaurant made coffee. This may be taking it to the extreme, but one of the advantages of pour over coffee is the simplicity of the tools. You actually can travel with your pour over coffee implements and not have to make any sacrifices. Everyone’s looking for gorgeous mothers day gifts but this gift offers a whole new approach to coffee drinking. Pour over lets you enjoy the coffee drinking experience. You make the coffee slowly (you may have to wait until the weekend to find time) and it is an enjoyable experience. It is all in the timing. So, what do you need to make pour over? To really enjoy pour over coffee I like to use an attractive gooseneck kettle. Some people are not fussed about the kettle, but for me, it’s all about the kettle. 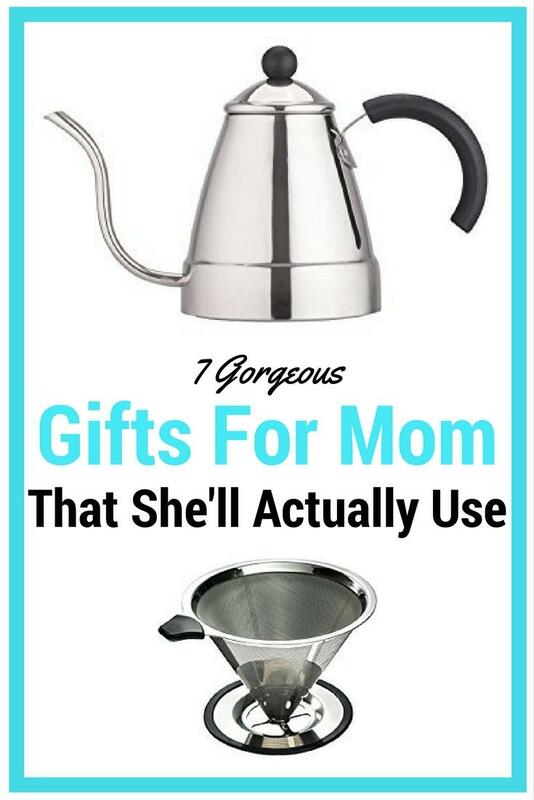 And if you’re buying a pour over gooseneck kettle for your mom then you’ll probably want an attractive one too. The gooseneck kettle gives you extra control over the pour rate of the water. Personally, I love to make myself a pour over coffee after everyone else in the family has gone to work or school. It’s my quiet time. So I use a cone filter over a cup. If you need to make a larger amount it just takes a bit longer and you’ll probably need something larger than a cup. But for mom, I recommend you give her the ability to make her own pour over coffee over her favorite cup. 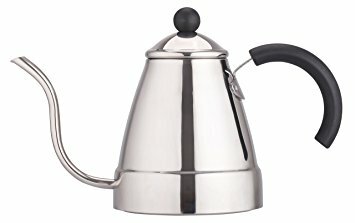 Does the kettle work on induction cooktops? This beautiful gooseneck kettle can be used on gas, electric or induction stoves. It is attractive and your mom won’t mind leaving it out on the stove top between coffees. It’s good to know the kettle doesn’t have an annoying whistle. It is made from high quality stainless steel. It is naturally BPA-free. The volume is 47oz or 1400ml. It isn’t too large or heavy which is an advantage for pour over coffee. It has a precise thin spout for flow control. This gooseneck kettle has a stay-cool stylish modern handle, away from the heat of the kettle, for extra safety. If your mom is new to pour over, she’ll need this stainless steel cone filter with cup stand. This handy stainless steel cone filter is re-useable. You don’t need to buy filters for it and it comes with a cleaning tool. It is also dishwasher safe. Together this kettle and filter cone are perfect for pour over coffee. Of course, your mom can use the kettle to boil water for tea as well. If you know your mom drinks coffee but she hasn’t got herself a gooseneck kettle yet, I highly recommend you take this opportunity to surprise her with this beautiful stove top kettle. If you’re looking for gorgeous mothers day gifts then you’ll discover this Babycakes Multi-Treat Baker is quite a treat! Not only can you make cupcakes, but cake pops and donuts too. Whenever I get a new small appliance I need to find a home for it in my kitchen. This multi-functional baker is a really thoughtful gift as well as being fun. It saves space by being 3 gadgets in one. And the treats are not just for the kids. What can it make other than cupcakes? Of course, you can make all the sweet yummy cake pops and cupcakes your family crave. But you can also make sophisticated treats like ebelskivers (Danish puffed pancakes), bacon cheddar bites, Swedish meatballs, goat cheese pesto cups and even healthy donuts. It makes 7 cupcakes, 7 donuts or 12 cake pops per batch. The high quality, heavy duty cooking plates are completely removable from the appliance. This makes them so easy to wash. The baking plates are non-stick so you don’t need to use cupcake liners if you don’t want to. I love using this Babycakes multi-treat baker for after school snacks. I can cook a single batch for the kids without heating up the whole oven. Sometimes we make savory snacks and other times sweet treats. Can it make healthy food? 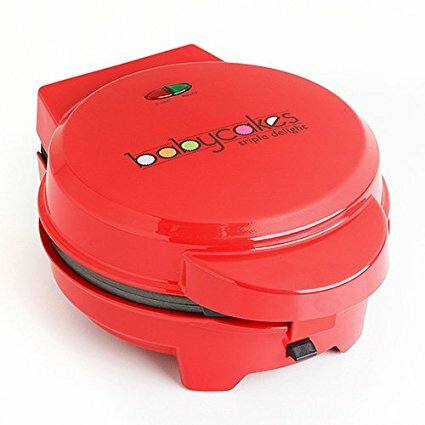 When I’m trying to eat healthy I whip up a couple of batches or quinoa pizza bites or mini cottage cheese frittatas using the Babycakes multi-treat baker. I keep the extra ones in the fridge for healthy snacks or to have at lunch with a salad. This multi baker is so versatile and loads of fun. It makes a great gift. If you want to give mom something to give her kitchen instant color appeal then look no further. 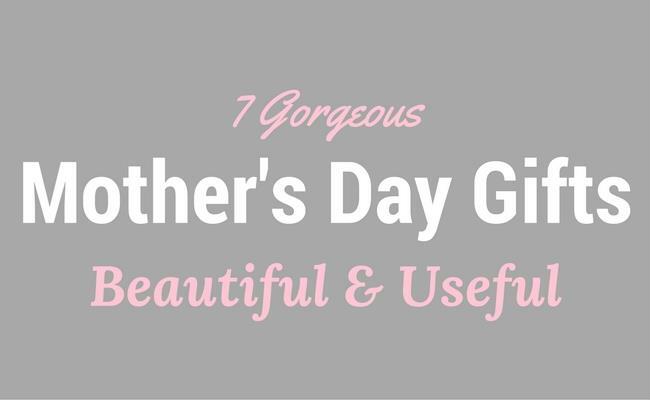 If you’re looking for gorgeous mothers day gifts, these items really hit the spot. These gorgeous ceramic mason measuring cups with spoon rest and spoons are a quick and easy way to make your kitchen look beautiful. They are also wonderfully useful which happens to be a bonus. If you think your mom has everything for baking this might just be the ideal gift. Instead of boring measuring cups she stores in a drawer, give her lovely colored ones she can keep on the counter. And as for the spoon rest, I know I can always use another one, no matter how many I have. Most of mine are boring and functional. If I was given a cute one, I’d happily display it on the counter next to my stovetop or next to my mixer all the time. If your mom likes to bake, this is an easy gift to decide on. I received my Smeg kettle and toaster as a gift and I adore them. Your mom will be delighted to receive them too. I warn you. They’re not cheap. But you really can’t get a better looking pair of small appliances. They are stand-out pieces in anyone’s kitchen. If you’re prepared to spend a bit extra on your gorgeous mothers day gifts, then these presents have a huge wow factor. Mine sit on the counter in my kitchen and I use them every single day. They are the most functional items and the most commented on items too. Everyone who visits my home loves my Smeg kettle and toaster. And most of my friends have them on their wish list. There are several gorgeous colors to choose from. You can mix and match the colors or keep them paired together (that would be my choice). If you really want to go to town on an impressive gift, get the matching Smeg mixer or Smeg blender too. Wow, I’d love to have those as well. They really are gorgeous mothers day gifts. They’re on MY wish list. Important: If you click on the Amazon links above you get to see ALL the colors available. Even if your mom has a popcorn maker, give her a new one. And if she doesn’t have one at all, there’s no reason to hesitate, just buy one now. 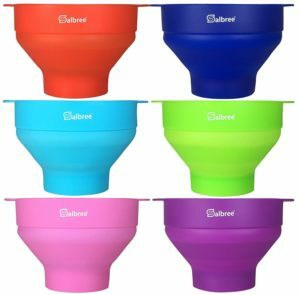 These Salbree collapsible silicone popcorn makers come in some great colors and they can be folded up to store away. 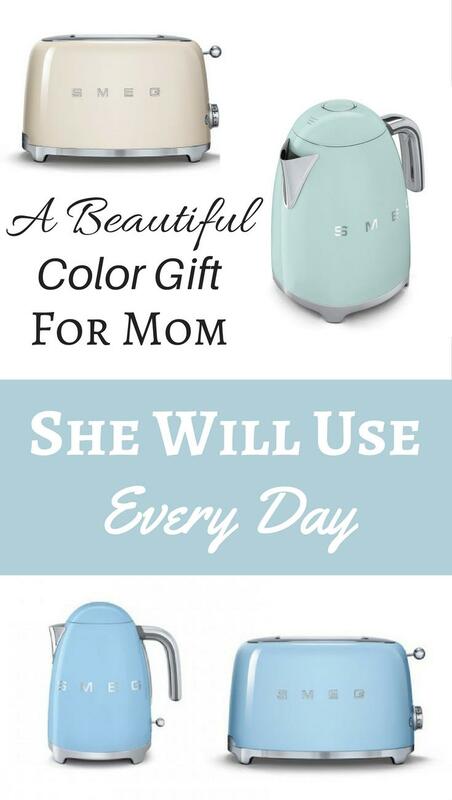 These popcorn makers are gorgeous mothers day gifts because you can choose her favorite color, or even just a great color to brighten up the kitchen. Every time she takes it out to use it, she’ll see that pop of color. There are about a hundred reasons to give the gift of a popcorn maker. Hundreds of different recipes for popcorn. When I was growing up we only ever put butter and salt on our popcorn. Don’t get me wrong, I’ve got nothing against the taste of buttered popcorn, it’s still my favorite. But, these days, more often than not we make a variety of flavors of popcorn at home. If we’re having a family movie night at home we make both savory and sweet popcorn. I recommend starting with some spicy flavors using dried herbs and spices. Then step up your popcorn game and try making caramel popcorn. All the popcorn recipes start by popping the corn kernels. This is where this Salbree silicone microwave popcorn maker comes in handy. A popcorn maker is a gorgeous mothers day gift but you also know the whole family will benefit from it, with delicious popcorn. I’m looking for gorgeous mothers day gifts, but is popcorn healthy? Popcorn is actually quite a healthy snack. When I’m watching calories I use the popcorn maker to make healthy snacks. With just some salt sprinkled over the top I have a satisfying snack which stops me looking for unhealthy highly-processed foods. With only 31 calories per cup of air popped corn and lots of healthy fiber, this popcorn maker is a healthy food maker in disguise. I say in disguise because it is really a fun food maker. The kids will love it no matter what sort of popcorn recipe you make. This Salbree silicone microwave popcorn maker needs no oil. The popcorn kernels are air popped in the microwave. You can still use oil if you want to, it’s your choice. How much popcorn does it make? Another advantage of this Salbree popcorn maker is that you can make small quantities of popcorn as well as large. It has measuring marks on the bottom of the silicone bowl making it easy to know how many corn kernels to pour in. If you only want one serve of popcorn, this can do it. If you need enough for the whole family, easy. This popcorn maker also comes with a lid so you don’t end up with popcorn flying out of the bowl and making a mess in your microwave. The handles on the side are part of the silicone bowl. So no need for oven mitts. Of course, you still need to be careful because silicone gets very warm, but generally I’ve found it to be easy to handle after heating. This is a fun gift for mom. It is practical and produces tasty and healthy popcorn. The whole family will enjoy the results. With so many great colors to choose from, find your mom’s favorite color and she’ll love it. Important: remember to buy a packet of popcorn kernels to add to your gift. Important: if you click on the Amazon links above you can see all the colors available. Personally, I love using cooking appliances with beautiful color. It adds a touch of excitement to your kitchen. 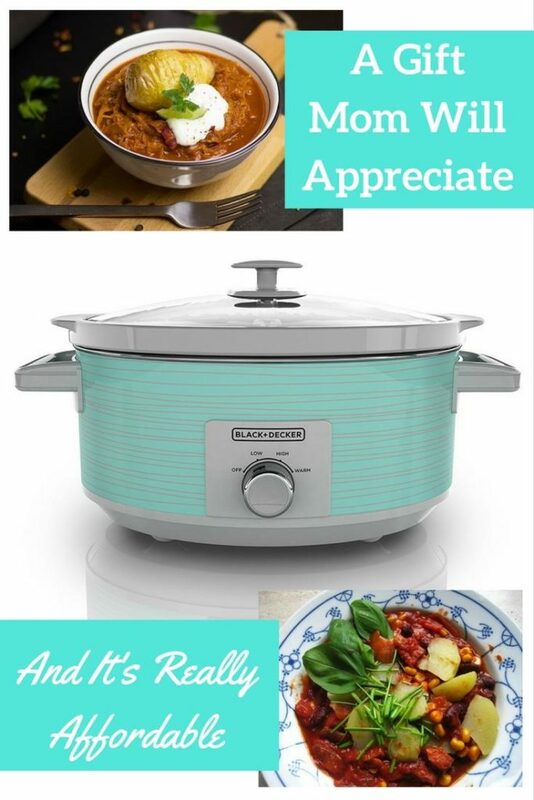 And if you’re trying to find a gorgeous mothers day gift then this Black & Decker 7-Quart Slow Cooker looks cute in teal. If your mom is not into teal, there are other designs too. This slow cooker is very well priced. Usually to get great color on a kitchen appliance you need to pay a lot for it. This slow cooker is actually reasonably priced. Slow cookers are one of the best modern cooking secrets. I can take a cheap cut of beef and turn it into the most delicious, tender and tasty meal my family has ever experienced. Apart from the initial preparation there is virtually nothing to do but wait. The slow cooker does all the hard work for you. This lets me get on with other things around my home. 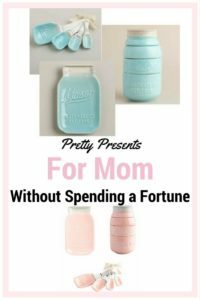 Personally, when I’m searching for gorgeous mothers day gifts I like to find something that is time-saving because I know it will serve my mom well. A slow cooker definitely fits the bill. The inner bowl is made from stoneware. It’s a fully removable crock pot. The slow cooker is large enough to fit 8 serves for the family. This slow cooker even has a built in lid holder so you don’t need any extra counter space to put the lid down when you lift it off. The crock pot and lid are both dishwasher safe, making clean-up a breeze. No one wants to do lots of washing up after eating a delicious meal. If your mom cooks dinner for the family, she’ll appreciate this Black & Decker Slow Cooker as a gift. It looks good and can be used almost every day, depending on your recipe. 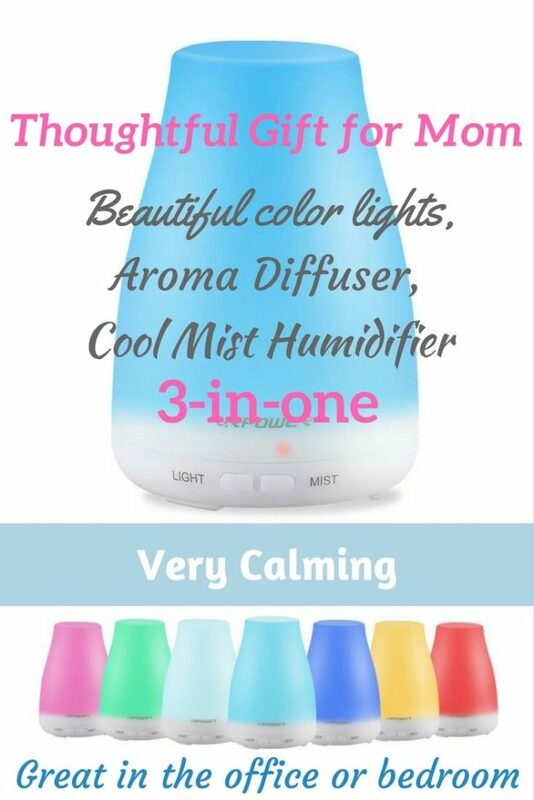 This URPOWER Aroma Diffuser Cool Mist Humidifier is a perfect give for your mom because it has beautiful light colors, can be used as a humidifier without oils or as an aroma diffuser with oils. Your mom can use it in her office or bedroom. I have one in both these rooms. The colors it emits are lovely and soothing. When you’re looking for gorgeous mothers day gifts, it’s good to know your mom can customize it to her liking by choosing the color she prefers each time she uses it. You can let the colors change automatically or you can choose your favorite color and press the button to keep it on that one. The blue light colors are my favorites. So calming. Of course, if you don’t want to use the color lights you can just switch the light off and use it without a light. Do you add oils or not? To add essential oils and use it as a diffuser, simply add the water then 2-3 drops of oil. I’m a fan of lavender oil for night time and during the day you can’t go past jasmine and gardenia oils. However, your mom might like other scents. For the price of a boxed sampler set of essential oils, you give your mom a choice in scents. And if your mom already has a diffuser and you’re looking for gorgeous mothers day gifts, here’s your gift ready to buy and already boxed. If you’re unsure what scents she likes, you could always buy her a boxed set of essential oils along with this URPOWER Aroma Diffuser Cool Mist Humidifier so she can try a few different essential oils and mix them as she likes. The advantage of this Aroma Diffuser is that it can also be used as a Humidifier. Just add 100ml of water (a measuring jug is included), forget about the oils and you’ve got a great humidifier. When you’re looking for gorgeous mothers day gifts, you give a great present when it’s 3-in-one. I love having a small humidifier on my desk while I’m working. It combats the drying effect of air conditioning and heating, depending on the season! Great in the bedroom too. It’s small enough to sit on a side table. It has an automatic shut off feature for when it runs out of water. Depending on whether you run it straight or use it on intermittent mode you can get up to 6 hours running time without refilling. If you do decide to buy one for your mom, it’s best to get the 2nd version. It produces more mist than the 1st version. This URPOWER Aroma Diffuser Cool Mist Humidifier is a beautiful gift. So, stop hunting for gorgeous mothers day gifts and start buying. The colors are gorgeous. It’s easy to use. It’s a really good diffuser/humidifier for the price and high quality. With all these advantages, grab one now for your mom, before they sell out. ☑ Is your Mom a coffee lover? See the best pour over kettle gift ideas here.